Now you may think this is all about L'Auto and advertising for sales, as we know the story of the tour quite well. But, as always there are more interesting facts to consider. Spies, treason, secret meetings in Paris - Captain Alfred Dreyfus didn't know his conviction would be one of many factors leading to the birth of the pinnacle of the sport - the Tour de France. In the early 1890s the Dreyfus affaire rocked France. The young artillery officer Alfred Dreyfus was convicted for treason. Young Dreyfus had allegedly sold French military secrets to Germany via the German Embassy in Paris. Solitary confinement in French Guinea can scare the strongest of men, Dreyfus was sentenced to life imprisonment in 1894. Luckily for him, he just spent five years there. Later new evidence came to light, suggesting that Dreyfus was innocent, as another French officer was responsible for the contact with the Germans. Still, Dreyfus was sentenced to prison for many more years, based on a dodgy claim by the French military. 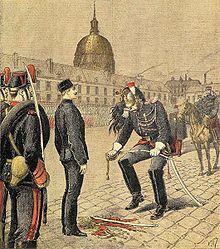 Words of the framing of Dreyfus spread quickly and during the next years France was divided on the matter. The debate raced on for years. Comte Jules-Albert de Dion, strongly believed Dreyfus was guilty, one time debates became so heated he hit the French President in the head with a walking stick. The incident resulted in 15 days in prison and a 100 francs fine. Meanwhile, the editor of the largest sports newspaper, Le Velo, Pierre Giffard, thought Dreyfus was innocent. Giffard wrote many articles in a way that made de Dion to drew swords with a couple of other anti-Dreyfusards such as Adolphe Clément and Édouard Michelin, who opened a rival newspaper, L'Auto. Of course, the appointed editor of this daily newspaper was Henri Desgrange, picked partly because of his reputation as a cyclist, partly due to his abilities as a reporter and partly because his network in cycling. Back then Desgrange owned a velodrome together with Victor Goddet. Low sales did not please the backers whilst Giffard smiled and clearly enjoyed the smaller newspaper's struggles. As you probably know, the tour was started to generate increased sales. Desgrange has got most of the cred for starting the tour de France. A fact most are not aware of, is that the idea was proposed by a young journalist named Géo Lèfevre. The 26-year old was poached from Giffard some time earlier. As normal when big hairy goals appear , doubt and hesitance filled the room inside 10 Rue de Fauborge in the Montmartre area of Paris. Until Goddet, who held the financial director position, enthusiastically handed the doubtful Desgrange the keys to the safe saying: "Take whatever you need." The Schlecks vs Bruyneel - rumble with a cause?